Julia's Fashion Minute: My Boyfriend Scales Walls - O.P.I. My Boyfriend Scales Walls - O.P.I. 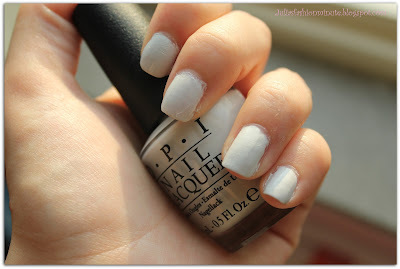 Today I'm showing you the swatches of My boyfriend Scales Walls by OPI. Most white nail polishes say 'BAM Hello I'm wearing white on my nails.' But this one doesn't because it has a greyish shine to it. Which also makes this white nail polish really unique & very subtle. The only thing I don't like about it is that it's quite streaky. You need more than one layer to get rid of the streakiness. But now that I am thinking about it it can also be the fact that I first applied hand cream to my hands/nails & a base coat & than this nail polish. But overall I really like the color, I only needed two coats & it's very subtile for a white! I'm not sure if it is my favourite of the spiderman collection. I will swatch all the colors that I have soon.